Online Reading Quizzes 2.0 – Teach. Brian. Teach. 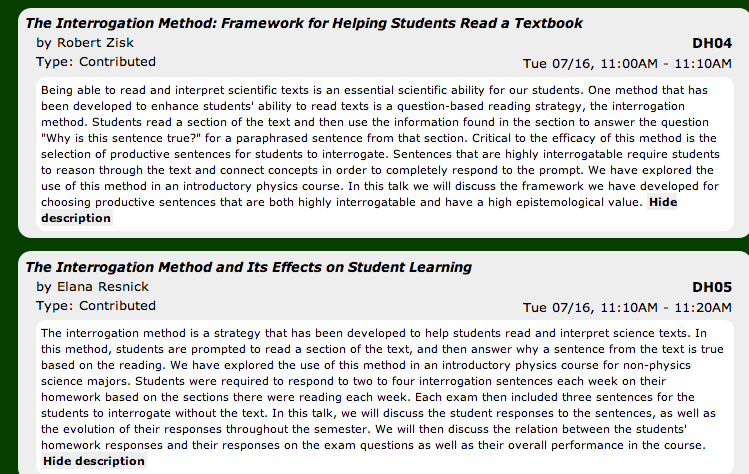 The two talks below at AAPT Summer 2013 have motivated me to re-think what kinds of questions I should ask students to consider online. First, I should say I think we don’t have a very good text for my intro physics course. Students are expected to read the text before class, and the typical way things go is students have a 5 MC quiz when they walk in the door. My strategy has been to have students answer questions online before class (graded for effort), and then use low-stakes standards-based grading quizzes which students can reassess on. Because of the bad text, previously, my goal had been to use the online quizzes to introduce questions, exercises, and links to external resources to supplement the text with good stuff the text lacked. Now my goal has switched a bit toward helpings students engage with the text more meaningfully (even if it isn’t great). My hope is to get students engaged back with the text, and to make reading strategies explicit both in and outside the classroom. Each of the strategies below I hope to practice with students in class before introducing to students in the online reading quizzes. One thing this exercise has forced me to do is actually read the text carefully, and look for opportunities for students to engage. Right now I’m considering how much autonomy to give students, and whether and how I’m going to let students decide later on what sentences, equations, etc to interrogate. That would be the goal, right? For them to monitor their own understanding, and decide where to put forth the effort to “dig deeper”. Anyway, here are some of the things I’m considering, with an example to help illustrate it. Feedback, suggestions comments, criticisms, questions welcome. Explain why this sentence is true? Equation 3.2 on page 25 defines “average acceleration in the x-direction”. Imagine you are driving a car along a long straight road, and then you begin to speed up. Explain how you could use the car’s speedometer and a stopwatch to determine the car’s average acceleration. Why does that procedure make sense in terms of the definition provided? Part I: First, go find a friend or family member. Next, get a piece of paper and a textbook. Discuss with your friend what will happen when you drop the piece of paper and textbook from the same height at the same time. Which will hit first? Be sure to explain why you think so to each other. Do it and see what happens. Part II: Now crumple up the piece of paper. You are going to repeat the experiment again with the crumpled paper, but before you do so, discuss with your friend what you both think are going to happen and why. Part III: Finally, grab various objects and have fun dropping them–tissue plastic bottles, paper, pencils, coins, dollar bills, rocks, baseballs, whatever. Drop them from various heights if you want. Don’t break anything that shouldn’t be and don’t hurt anyone. Based on the text’s definition of “free-fall” (read the 2nd paragraph) which objects do you think underwent free-fall motion? Which one’s would you say did not undergo free fall motion? Explain how you used the definition to help you decide. Under what conditions will two objects dropped from the same height at the same time hit the ground at the same time? When will they not? You are driving your car along a straight and narrow road, while maintaining a constant speed of 60 mph. Above, an airplane flies with a constant velocity of 500 mph. Which of the following statements best characterizes how the car’s acceleration compares to the plane’s acceleration? It’s impossible to tell how the accelerations compare from the information above. (a) First off, the author has clued us in that the acceleration is not zero at the top, but let’s play along. Intuitively, why does it make sense to think that the acceleration at the top is zero? What reasoning might a person give who thinks it’s zero? (b) You Choose: Either write down an idea you have about why the acceleration cannot be zero at the top OR write down one question you’d like to discuss in class about the acceleration of a ball in free-fall. I like that your categories give students a list of different ways to reflect on their reading. I might add another category about connecting the current reading to previous concepts from class. Maybe after a few times of providing students with questions you crafted you could start asking them to come up with their own questions. To start, students could simply jot a thought, question, or confusion in their notes and bring them to class. Then in class you could spend some time helping students to articulate what confuses them, why they think that sentence needed interrogating, what a relevant question might be, etc. I like your suggestions to have questions that support looking for connections among disparate parts of the task. It seems obvious now that you say it. It’ll certainly be on my to-do list. I also hope to do what you are also suggesting-put more responsibility on them as the semester goes on. I’m wondering if google moderator might be good for that…students select and can vote on good sentences for interrogation. Mylene has great stuff for reading comprehension. She the one that has really convinced me of the need to spend time in class reading and discussing reading strategies. Chi’s self-explanation works seems relevant here, too. Pingback: Ramping up Changes: PFL, Reading, and SBG | Teach. Brian. Teach. I teach Math (among other subjects in primary school) and I enjoyed reading about the 2 types of interrogation (sentence and equation) – I am now thinking of ways to apply them in our inquiry-driven math sessions. Thank you for sharing. *As a side note, your blog is very informative, thoughtful and detailed – rare qualities these days. Thanks Cristina. I found your blog through Michael Doyle, and look forward to getting to know it better!